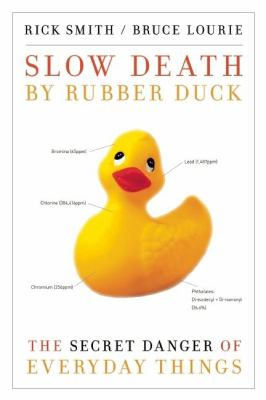 Slow Death By Rubber Duck : The Secret Danger Of Everyday Things - ubiq bookshop: the best place to buy books! Pollution is no longer just about belching smokestacks and ugly sewer pipes--now, it's personal. The most dangerous pollution, it turns out, comes from commonplace items in our homes and workplaces. To prove this point, for one week authors Rick Smith and Bruce Lourie ingested and inhaled a host of things that surround all of us. Using their own bodies as the reference point to tell the story of pollution in our modern world, they expose the miscreant corporate giants who manufacture the toxins, the weak-kneed government officials who let it happen, and the effects on people and families across the globe. This book--the testimony of their experience--exposes the extent to which we are poisoned every day of our lives, from the simple household dust that is polluting our blood to the toxins in our urine that are created by run-of-the-mill shampoos and toothpaste. Ultimately hopeful, the book empowers readers with some simple ideas for protecting themselves and their families, and changing things for the better.